Not the best of Welsh's adaptations, but worth a watch. The film has some brilliant moments. 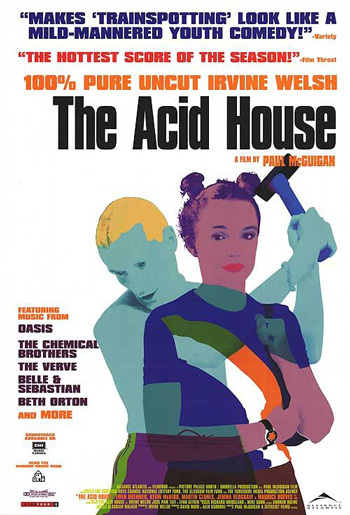 Adaptation of Irvine Welsh‘s book by the same title, The Acid House packs everything Welsh: the lowest of low & a bizarre mix of emotions evoked at everything wrong. The Acid House is a collection of 3 short films based on the short stories from The Acid House: The Granton Star Cause, A Soft Touch, and The Acid House. The Granton Star Cause: Everything goes wrong for Boab, then he meets God at a bar. And God makes it worse. The first short captured the essence of the story, but its pace failed to deliver the shock. Before the momentum picks up & you can feel Boab’s pain and laugh at it (and then sympathise with it), it’s already over. A Soft Touch: Larry’s wife fucks his neighbour upstairs while he suffers their tragic marriage & takes care of their baby. This one was bang-on. Pun intended. This was the best out of the three. Welsh captured on-screen. Wonderfully! The Acid House: Consciousness of a new-born and LSD-crazed Coco (a typical vermin from Welsh’s world) switch when lightning hits them at the time of baby’s birth. Coco becomes like an infant, and infant becomes a drinking & swearing baby. Except for Ewen Bremner (Coco) and the baby’s father, the actors weren’t convincing. Coco’s girlfriend, in particular, was very unconvincing—thereby breaking the spell of the film. Not to mention the creepy looking mechanical baby. The distractions killed the last short, it could’ve been better. All in all, the film was satisfactory. Not the best of Welsh. Nowhere close to Trainspotting. But worth a watch if you like Welsh. The film has some brilliant moments. I still think the film could’ve played around much more with the material at hand. Published on February 25, 2014. Updated on February 25, 2014.